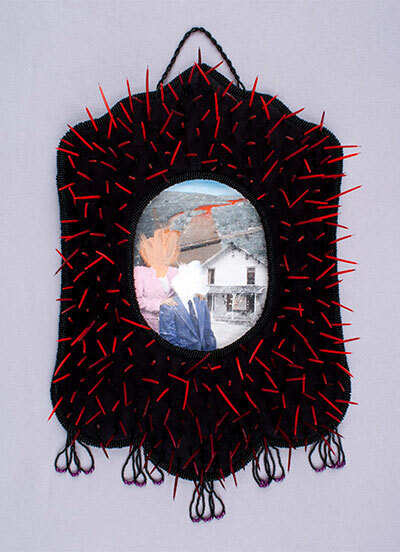 Frames weaves together personal narratives, familial relationships, historical trauma, and healing in a series of mixed media works and paintings. Through this work, Luanne thinks about what kind of relationship she will build with her son and explores her existing relationships with the people in her life. Good or bad, how have they impacted who she is and by extension what other events have shaped her family. Luanne Redeye uses painting as a way to see others. Working primarily in oil she depicts the relationship between perception and experience of native identity through genre scenes, designs, and portraits. Born in Jamestown, New York, Luanne grew up on the Allegany Indian Reservation in Western New York. It is from here where she draws inspiration incorporating community and family members into her paintings, which gives her works a strong personal and emotional component. Luanne currently lives in Albuquerque, NM. An enrolled member of the Seneca Nation of Indians and Hawk Clan, she studied at the University of New Mexico receiving her MFA in 2011. She has exhibited throughout the US and has been the recipient of various awards including most recently the Barbara and Eric Dobkin Fellowship at the School for Advanced Research in Santa Fe, NM. “As a figurative artist my work is an intersection of autobiography and community. Representation of Native peoples from a Native perspective is important to me. I want my friends, family, and community members to be seen through genre scenes and portraits. Sometimes that representation includes specific, identifiable things from our culture and sometimes it does not. The work asks the viewer to search further for the paintings meaning to wonder “why this image” or “why this person or these people”.